Today it is Shrove Tuesday in the United Kingdom. It is also known as Pancake Day. It is the last day before Lent, a period of time when Christians give up certain foods. Traditionally, people in the UK would make pancakes on Shrove Tuesday, so they can use up all of their fat, butter and eggs. Nowadays, people sometimes give up a food that they enjoy. It could be chocolate, sweets or biscuits. It is fun trying to flip the pancakes in the frying pan. Here is the Duchess of Cambridge having a go! I thought you might like to have a go so i have sent you the recipe. They taste delicious (especially with chocolate). Now make a hole in the centre of the flour and break the eggs into it. Then begin whisking the eggs and a small amount of flour. Gradually add small quantities of the milk and water mixture, still whisking. Don't worry about any lumps as they will disappear as you whisk. Now melt the 50g/2oz of butter in a pan. Spoon 2 tbsp of it into the batter and whisk it in. Now get the pan really hot, then turn the heat down to medium. Add 2 tbsp of batter into a 18cm/7in pan. It should take only half a minute or so to cook. You can lift the edge with a palette knife to see if it's a golden colour. Flip the pancake over with a knife - the other side will need a few seconds only - then simply slide it out of the pan onto a plate. 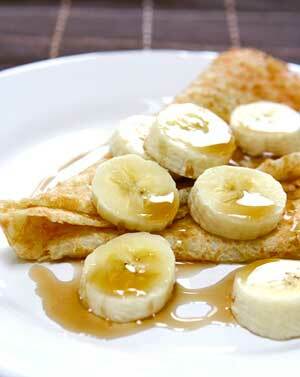 To serve, sprinkle each pancake with freshly squeezed lemon juice and caster sugar. Or you can add some chocolate, honey or fruit.